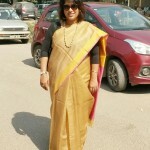 This is one of the first sarees I wore to work when I took up the pact. As usual I got queries in office if it was a special occassion which I put to rest saying – No, Im just wearing my sarees that are lying in my closet and this is going to happen more frequently! !